These gloves in camo green are especially suitable for MMA because of the thinner foam layer and the open fingers. MMA gloves are a lot lighter compared to kick boxing gloves, but offer enough protection at the knuckles. Equipped with the Joya Fight Fast logo. Made of 100% genuine leather with a thick padding also at the thumb. The Velcro closure that goes all the way around ensures a good and tight fit. Also available in brown. These blue / black gloves from Gear for Fighters are especially suitable for MMA or Krav Maga because of the thinner foam layer and the open fingers. MMA gloves are a lot lighter compared to kick boxing gloves, but offer enough protection at the knuckles. Equipped with the G4F logo. Made of 100% genuine leather with a thick padding also at the thumb. The Velcro closure that goes all the way around ensures a good and tight fit. With these new black gloves your knuckles are even better protected. The glove offers a thick layer of foam around this area, but leaves the fingers still sufficiently free. That is why this glove is extremely suitable for MMA, Krav Maga or Jiu Jitsu. MMA gloves are a lot lighter compared to kick boxing gloves. 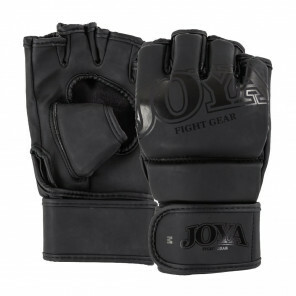 Equipped with the Joya Fight Gear logo in stylish black. Made of 100% genuine leather with a thick padding. The Velcro closure that goes all the way around ensures a good and tight fit. Also available black / white. These gloves in stylish green are made of high quality leather and of excellent quality. 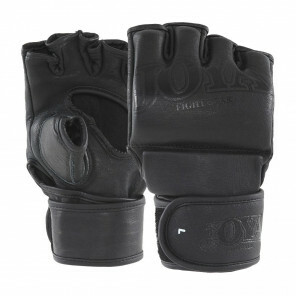 Due to the thinner foam layer and the open fingers, these gloves are especially suitable for MMA, Krav Maga or Jiu Jitsu. MMA gloves are a lot lighter compared to kick boxing gloves, but offer enough protection at the knuckles. 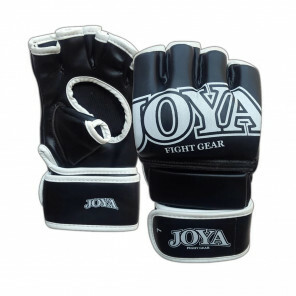 Equipped with the Joya Fight Gear logo. Made of 100% genuine leather with a thick padding. The Velcro closure that goes all the way around ensures a good and tight fit. Also available in matte black. 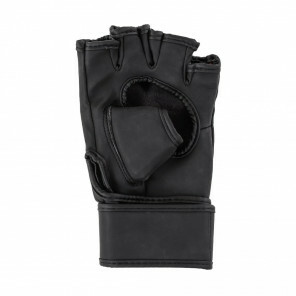 These matt black gloves are made of high quality leather and of excellent quality. Due to the thinner foam layer and the open fingers, these gloves are especially suitable for MMA, Krav Maga or Jiu Jitsu. MMA gloves are a lot lighter compared to kick boxing gloves, but offer enough protection at the knuckles. Equipped with the Joya Fight Gear logo. Made of 100% genuine leather with a thick padding. The Velcro closure that goes all the way around ensures a good and tight fit. Also available in green. These gloves in brown are especially suitable for MMA because of the thinner foam layer and the open fingers. MMA gloves are a lot lighter compared to kick boxing gloves, but offer enough protection at the knuckles. Equipped with the Joya Fight Fast logo. Made of 100% genuine leather with a thick padding also at the thumb. The Velcro closure that goes all the way around ensures a good and tight fit. Also available in camo green. These gloves in black / red are made of high quality leather and of excellent quality. Due to the thinner foam layer and the open fingers, these gloves are especially suitable for MMA, Krav Maga or Jiu Jitsu. MMA gloves are a lot lighter compared to kick boxing gloves, but offer enough protection at the knuckles. 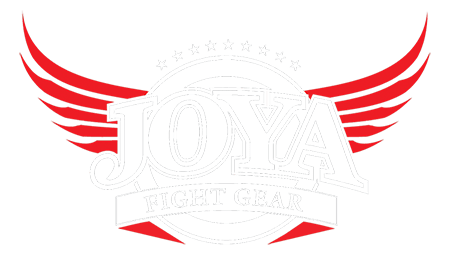 Equipped with the Joya Fight Gear logo. Made of 100% genuine leather with a thick padding. The Velcro closure that goes all the way around ensures a good and tight fit. With these new black / white gloves your knuckles are even better protected. The glove offers a thick layer of foam around this area, but leaves the fingers still sufficiently free. That is why this glove is extremely suitable for MMA, Krav Maga or Jiu Jitsu. MMA gloves are a lot lighter compared to kick boxing gloves. 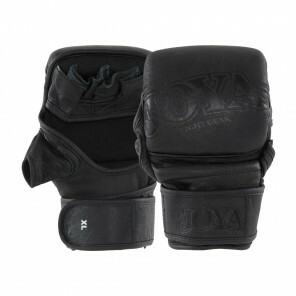 Equipped with the Joya Fight Gear logo in stylish black. Made of 100% genuine leather with a thick padding. The Velcro closure that goes all the way around ensures a good and tight fit. Also available in black. 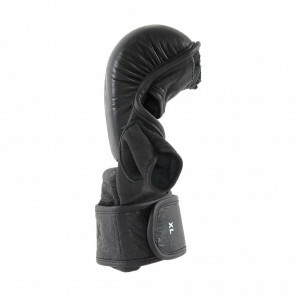 These gloves in black / white are made of high quality synthetic leather and well suited for the novice fighter. Due to the thinner foam layer and the open fingers, these gloves are especially suitable for MMA, Krav Maga or Jiu Jitsu. MMA gloves are a lot lighter compared to kick boxing gloves, but offer enough protection at the knuckles. 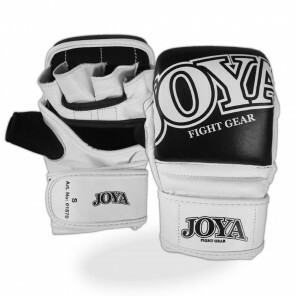 Equipped with the Joya Fight Gear logo in white. Made from synthetic leather with a thick padding. The Velcro closure that goes all the way around ensures a good and tight fit. Also available in black.